In every city, there are places that can’t be missed. 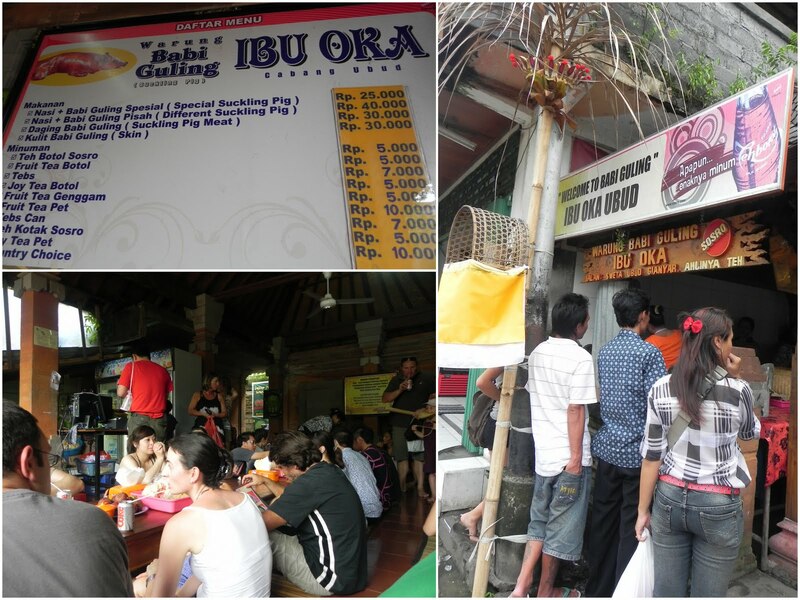 In Bali, there is a foodie pilgrimage that has to be made and that is at Ubud’s Ibu Oka. This is THE dive that Anthony Bourdain made famous in his No Reservations episode on Bali. It’s still in the same spot it’s always been and no renovations have been made (yet) so it’s still pretty authentic. Our blogger/foodie friends from Eat The World, Kiko and Maria, were in Bali on the Southeast Asian tour of their round-the-world trip and we thought it would be a good idea to go to Ibu Oka with them and taste why their Babi Guling (roast pig) was such a big deal. We met up with them at another Bali institution, Kopi Bali, which I think has the best coffee on the island, near our new home (yes, we finally found a place to live). After a quick espresso, we headed up North towards Ubud passing all the little villages on the way with each one specializing on a particular craft – stone carving, wood carving, basket making etc. – but we skipped all that and went straight to Ibu Oka. Just past Ubud’s monkey forest and diagonally across the street from the royal temple is this roadside stand/warung that dishes out paper-lined baskets of roast pork all day long. We arrived after 1 p.m. and since it was mid-week, there were no busloads of tourists queuing up for lunch on that day. They say that on weekends you need to get there before noon as they run out of pigs really fast. On that day, the place was full and although there wasn’t a line snaking out the door, there was a crowd right by the stall, buying roast pig to-go. After ogling the whole crispy-skinned pig near the entrance, we left our flip-flops in the large pile on the steps and went in to try and find a spot to sit. There were about 10 wooden tables lined up with the floors covered in mats and everyone sitting cross-legged, side-by-side eating loads of roast pig. We had to sit separately as there were no more places for four so Kiko and Maria went off to the middle row while A and I sat at a corner table facing the wall-mounted menu. We placed our orders quickly for two plates of Nasi (rice) + Babi Guling spesial (roast pig) for 25,000 Indonesian Rupiahs or around US$2.50 a plate. While waiting, we opened a few packets of the deep-fried delicacies stacked up in a plastic container in every table – krupuk (prawn crackers), melinjo crackers, pork cracklings. Despite the mess, crowd and confusion, the waitstaff knew exactly what they were doing and we got our orders not long afterwards. The two paper-lined baskets were identically stacked with steamed white rice, topped with thin slices of roast pork meat, a piece of crispy pork skin, a mound of spicy green beans and a few chunks of pork sausage. Was it good? Yes! Was it worth the trip up to Ubud? Yes again. We enjoyed it so much that we decided to order another basket of just slices of roast pork meat. This time it was better as there were several thin slices of roast pork drizzled with the drippings and topped with an even larger piece of crackling. At this point, the restaurant was still full and there were still people standing around waiting for a place to sit, and as it’s quite uncomfortable to sit cross-legged on the floor, we did a “dine and dash” and gave up our little spot to pay at the cashier. As we searched four our flip-flops in the growing mound of slippers and shoes on our way out, a motorcycle came chugging by with two men on it, one driving and the other balancing a metal tray with a whole roasted pig on his head. I missed that photo but that’s what Bali is all about – fleeting moments of interesting photo and food opportunities, if you look really hard and pay attention to what’s going on around you. Ibu Oka is one of those so get there if you can. 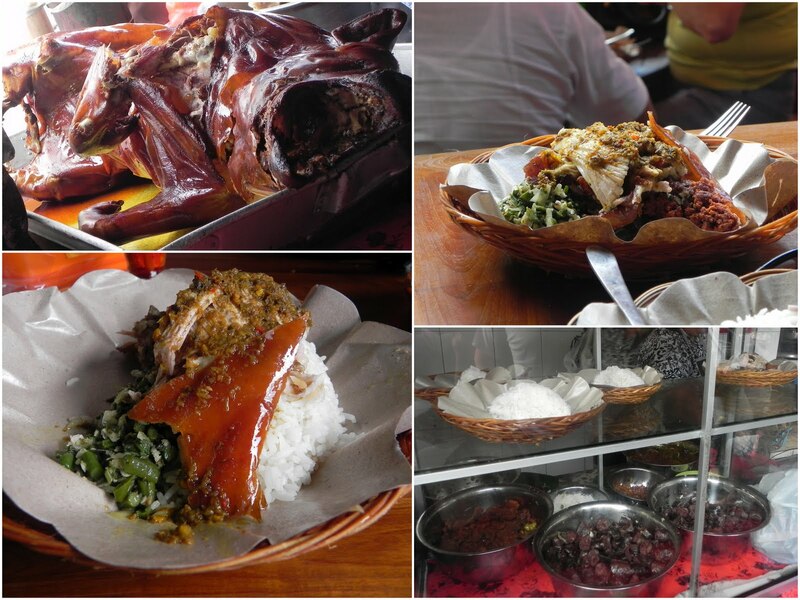 Have you tried the babi guling in Gianyar? My gf and I went there from a recommendation in a tiny guidebook on Bali. (yeah I know, guidebooks :P) As it turns out it was quite delicious. To this day I’m still not sure which one is my favorite between Bu Oka and Warung Pande.